Joan Baez – a moving moment of silence – at the Metropole air raid shelter, where she had spent so many fearful moments. Ambassador of History, Duc, looks on. 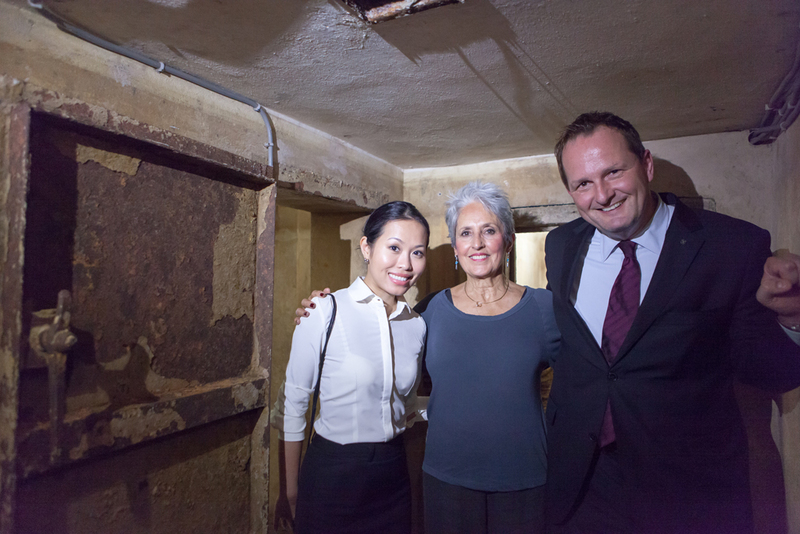 Joan Baez – with director of PR; Le Nhung, and general manager Kai Speth – at the Metropole air raid shelter, where she had spent so many fearful moments. 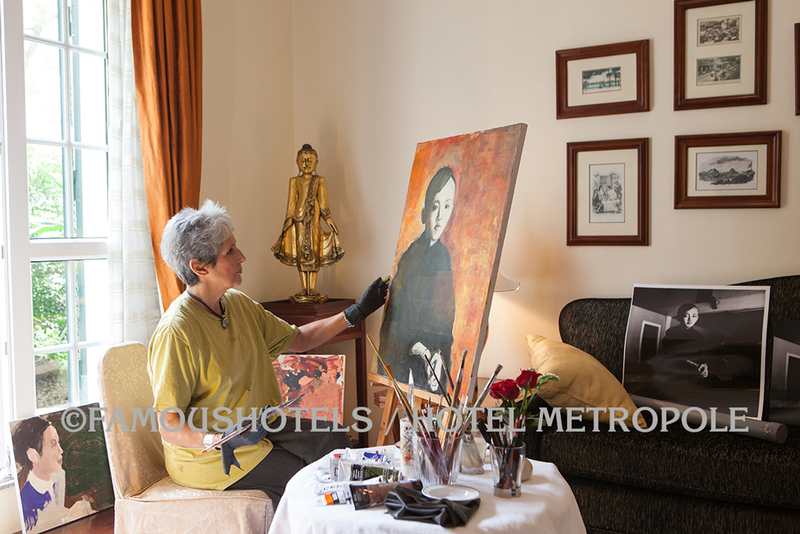 Joan Baez entering a new career: she is painting a portrait at her suite at the Hotel Metropole. Later, she donated that painting to the hotel. 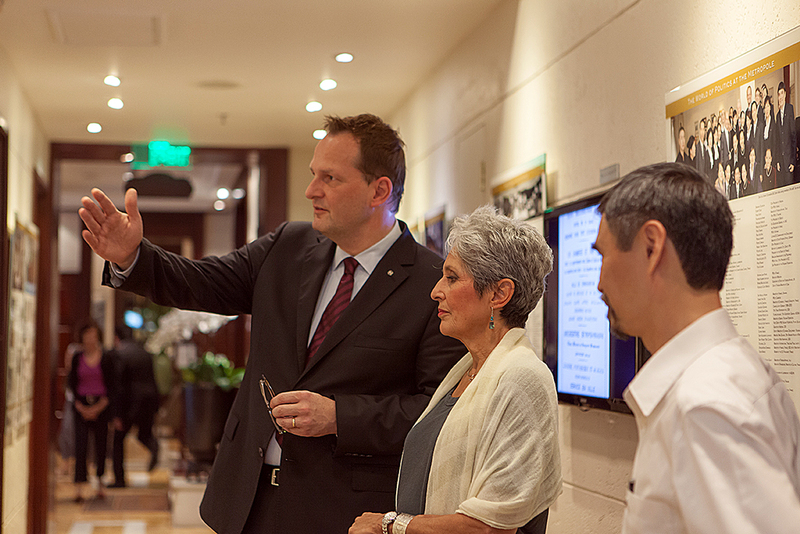 For over one week, singer and former peace activist Joan Baez stayed once again at the legendary Hotel Metropole Hanoi. This time in peaceful days she remembered her days at the hotel during the dreadful ‘Christmas bombing‘ of 1972. Dealing with my own mortality, which I thought was a terrible cosmic arrangement,” Baez said last week in an interview in the hotel in the Vietnamese capital, taking a break from a painting-in-progress on an easel beside her. “It is OK for everyone else to die, but surely there was another plan for me?” she joked. Baez stayed in the same hotel she and the rest of the peace delegation were put up in 40 years ago by the North Vietnamese government, which was happy to welcome those prepared to listen to its side of the story. 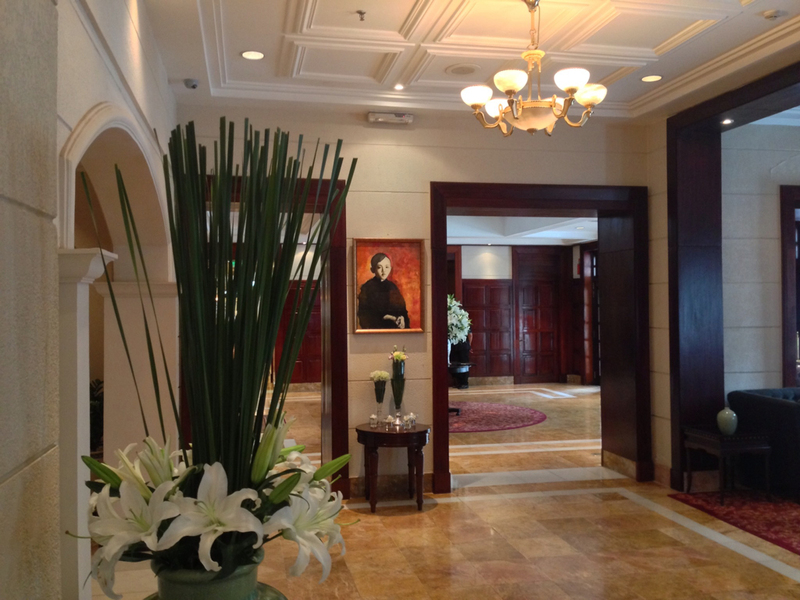 The building is now more luxurious, and goes under a different name, The Metropole Hanoi, but much of it remains the same. She was quick to visit the recently unearthed bunker that sits just beyond one of the hotel bars. Soon after descending, she put her hand to the cement wall, closed her eyes and sang out the African-American spiritual, “Oh Freedom,” a song she often sung during civil rights rallies in the United States in the 1960s. On her return from Vietnam in 1973, she released an experimental album, “Where Are You Now, My Son?” The record features taped, spoken-word recordings taken from the bunker and the hotel and the sounds of Hanoi, including air-raid sirens and dropping bombs. Over a piano accompaniment, Baez sings of her time in Hanoi, including the Christmas celebrations in the hotel lobby and morning trips to see the devastation left by the American bombs. Baez’s time trip to Vietnam is just one part of a life that blazes through the cultural and political history of the United States. She began her musical career in the folk clubs of Cambridge, where in 1961 she met Bob Dylan, who at that time was little known while she was a rising folk star. They had a high-profile romantic and musical relationship for a few years. Known mostly for singing other people’s songs, she has recorded more than 50 albums, mostly recently a 2008 record that was produced by Steve Earle. Baez has always placed her social activism ahead of her musical career, a commitment in part fostered by parents’ conversion to Quakerism when she was a child. A pacifist, she was a leading voice in the civil rights movement and the anti-Vietnam war protest. She has supported scores of campaigns across the United States dealing with poverty, racism, environmental degradation and the wars in Iraq, as well as oversea causes. She was on a private trip to Vietnam this time but visited a local international school where she sang and spoke to the children. She reminded them of her first act of civil disobedience as a 16-year-old when she refused to go home during an air-raid drill from her school in California. Asked how she keeps going as an activist, she spoke of the importance of personal “little victories” to set against the inevitable “big defeats” such as climate change and the unchecked pace of arms sales around the world, but also spoke of her need now to stay at home with her mother. She said America should have not responded with violence after the 9/11 attacks. Baez still tours the globe, but is now slowing down — just two monthlong tours this year compared to her previous three. But it’s painting now that really fires her. She has been at it for just eight months. The acrylic in the hotel in Hanoi of a young Vietnamese boy against an orange background is her first work that has ever been framed. Baez got in contact with the hotel after seeing media reports of the bunker being unearthed. She gave friends of hers visiting Hanoi in December a signed copy of “Where Are You Now, My Son?” with the instructions they should give it to the hotel management if “they are the right people” and, if they weren’t, to bring it home again. 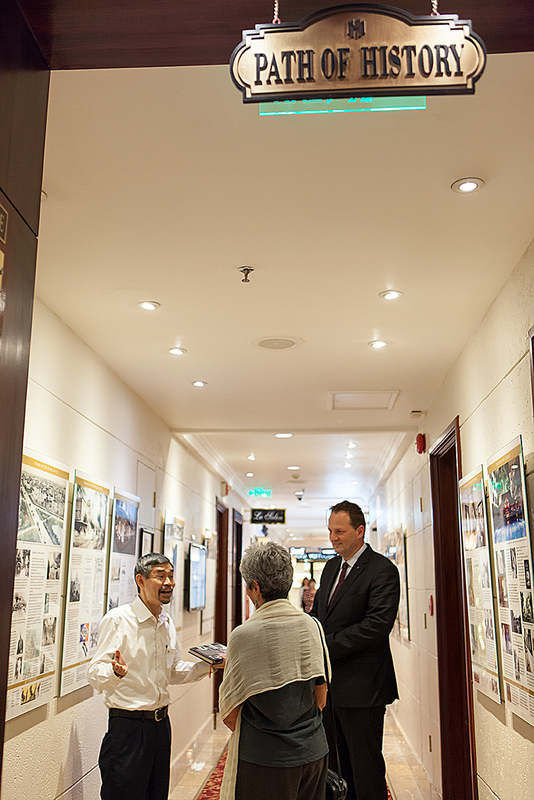 They handed it over to Metropole general manger Kai Speth, who led the hunt for the shelter and is proud of the hotel’s history. He gave Baez’s friends a book about the hotel with a note to Baez saying he would love to welcome her back. In February, she emailed saying she would like to come. Less than two months later she was walking through the door. 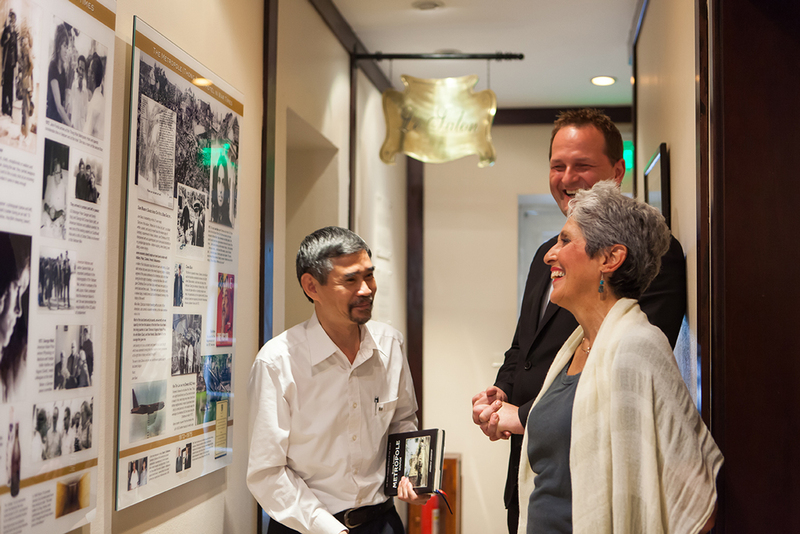 On the Saturday before her flight left, Baez shared tales of life of Hanoi under American attack and the hotel’s history with former staff, including its hairdresser and general manager. Many of them were on double duty: digging graves for the victims of the bombing as well as serving the hotel guests.